Great egg slogan ideas inc list of the top sayings, phrases, taglines & names with picture examples. 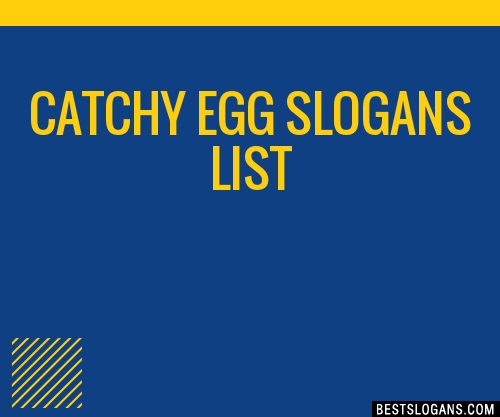 Here we've provide a compiled a list of the best egg slogan ideas, taglines, business mottos and sayings we could find. The results compiled are acquired by taking your search "egg" and breaking it down to search through our database for relevant content. 1 Better taste. Better nutrition. Better eggs. 4 Happy hens lay really tasty eggs. 5 If the egg is Goldrich, the yolk is golden. 6 It's not just any egg. It's Naturegg. 7 A fresh egg is... Nulaid. 8 Fabulous eggs by fabulous birds. 9 Simply delicious free-range eggs. 10 The incredible edible egg. 11 Have you had an Egg today? 12 Serve eggs, save money! 14 Pride in every egg. 15 British Lion Eggs. Fast food. And good for you. 16 Two Chicks. The whiter lighter egg. 17 Healthier eggs from healthier hens. 19 The real thing. Only better.